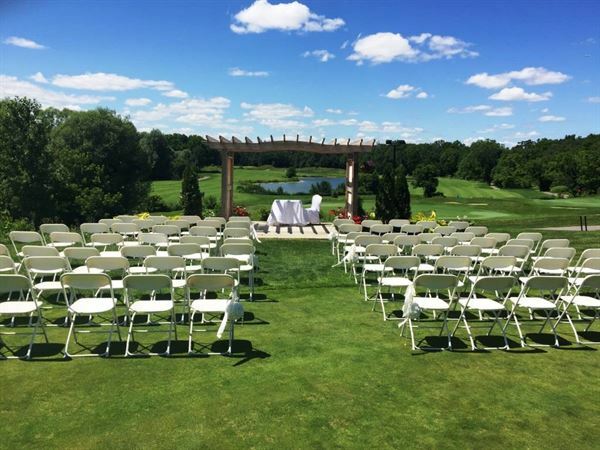 If you are looking for a stunning outdoor ceremony site that overlooks a golf course, water and a stunning tree line, Royal Ontario Golf Club is the venue for you. Our private ceremony site can host 30 - 200 guests. After the ceremony your guests can join us on our large patio that overlooks the golf course and enjoy the best in reception/beverage offerings. The banquet room has floor to ceiling windows running along the entire front of the hall so your guests have a beautiful view throughout your event. We offer All Inclusive Packages staring at $109 per person. Packages include; buffet or plated meal options, room rental, tax, facility fee, photo locations onsite, bridal suite, 5 hour bar service, wine with dinner, cocktail food offerings, late night service. Booking 2018 and 2019 weddings! Please contact for further information or to set up a tour.